These days, the Fourth of July seems to be all about the fireworks, poolside barbecues, and Pinterest-worthy dessert plates (which, admittedly, we love). But at the beginning of the 20th Century when the parade reigned supreme, the celebrations looked a little bit different. Here, a look back at the costumes and traditions that defined Independence Day celebrations around the United States. A sea of stars and stripes at a street parade in Watertown, Wisconsin, in 1941. A Young Child! With Fireworks! Apparently laws on firecrackers were a little more lax in 1906, as this little boy demonstrates. The United States has long been a melting pot of cultures. At a Fourth of July parade in the early 20th century, the Americans of Belgian Origin celebrate their adopted home. 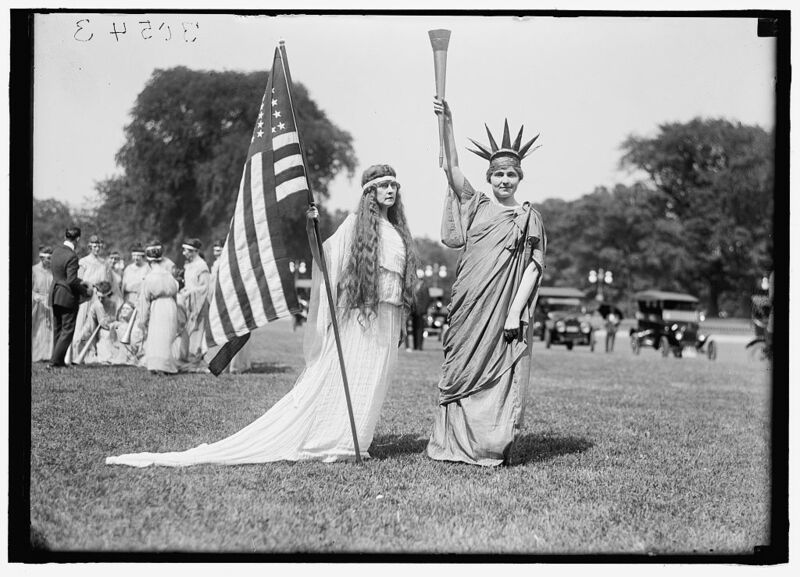 Two women dressed as iconic American symbols for a 1919 parade in Washington, D.C.
During a 1921 parade in Petworth, Maryland, these young women keep it festive and fashionable. There’s no such thing as too many stripes on the Fourth. These lady liberties strike a pose in Takoma Park, Maryland, in 1922. A beauty contest for girls of all ages during a 1940 celebration in Maryland. Contestants line up for a soapbox race at the same Maryland parade. The cars, typically homemade, are only propelled by gravity, must have brakes, and can reach speeds up to 30 mph. Because sometimes you need a break from the festivities. These picnickers nap in a park during a 1941 celebration in Vale, Oregon. At an Arizona parade in 1946, the Girl Scouts Drum and Bugle Corp keep the beat.